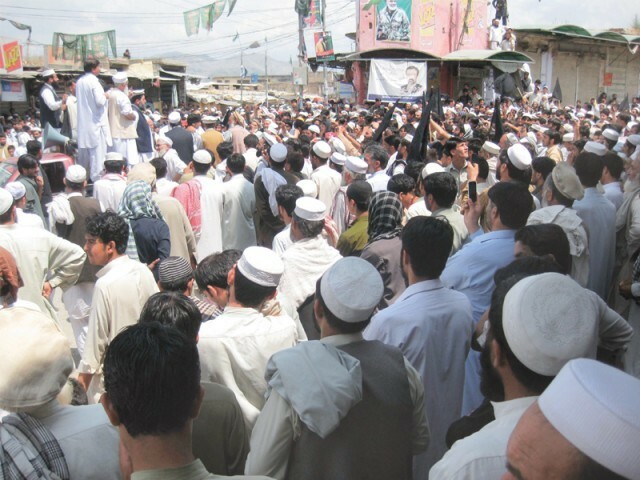 PESHAWAR: Thousands of tribesmen from different parts of Bajaur Agency, denouncing the killing of two innocent daily wagers in Lahore, Sunday staged a protest demonstration at Inayat Keley near Khar. Tribesmen from almost all political parties and communities participated in the rally where they condemned the federal and Punjab government’s silent role in the assassination of two innocent persons from Bajaur Agency. Majority of protesters, however, who attended the protest rally, were associated with Awami National Party (ANP) and Pakistan Tehreek-e-Insaaf (PTI). On Friday, some unknown men riding motorbikes opened indiscriminate firing on three labourers near Data Ganj Bukhsh shrine in Lahore. As a result of firing, two persons died on the spot whereas the third one sustained serious injuries. The third person is said to be in a serious condition at a hospital in Lahore whereas the dead bodies of Ziaur Rehman and Awal Khan reached Bajaur on Saturday. Both the deceased persons were laid to rest at their local graveyards in two different villages of tehsil Mamoond, bordering with Afghanistan late on Saturday evening. Thousands of people from all over Bajaur Agency including local and non-local leaders of different political parties and PTI MNA Ali Muhammad Khan attended the funerals. Assembled in the main bazaar of Inayat Keley, the main commercial city of Bajaur Agency, the protests were addressed, besides others, by ANP leaders Shah Wali Khan and Fateh Rahman, PTI leader Gul Zafar Khan and a leading tribal elder Sultan Khan. Protesters chanted slogans against both the federal and Punjab governments and demanded the early arrest of the culprit’s involved in the crime. Addressing the protestors, tribal elders said that unfortunately, Pakhtuns were being sacrificed for the purposes of others for long. In the last two decades, millions of Pakhtuns from all over Khyber Pakhtunkhwa and tribal areas were not only forced to abandon their homes but were being chased by terrorists throughout the country even now. They demanded the government to take early steps for the protection of lives of innocent tribesmen, who were scattered throughout the country to earn livelihoods. Through a resolution, the protest rally demanded the government to arrest the culprits involved in the killing of these two innocent tribesmen at the earliest and compensate the affected families. It reminded that both the persons were bread earners of their families, who were already affected by military actions and reactions.